I find myself in Austin at SXSW right now vs. coming home from Las Vegas and DSE. I have missed my friends at DSE and there are, no doubt, several (if not many) cool things emerging in the field of digital signage/enabling technologies that have surfaced there. But as I walk around SXSW, I can’t help but think of all of the similarities between the two conferences. 1. People are always going to use technology for technology’s sake – one of the best quotes I’ve heard today is, “alot of gadgets (read, “technology”) don’t solve the right problems.” I don’t know whether this is because people don’t dig deep enough to find the real problem or if they don’t care about problems, they just want to use technology. This is the problem with so much cool technology bombarding us – basically anyone can make anything with it. 2. There are very smart people out there who know how to purposefully use technology – yes, there are many, many crap emerging technology solutions out there, but there are also many good ones. One that I learned about today is: Food. You. Me. For anyone who likes to cook and has had thoughts about hosting a dinner party, but just didn’t feel confident that they could pull it off, this app is for you. It’s smart. These guys recognized a need to make novice cooks comfortable and knowledgable in cooking for more people than themselves, so they’ve created a utility-based app. (It’s in BETA right now, so if you’re interested, sign up to receive updates via email.) Although this particular example is about cooking, it’s an example of an insights-driven approach to solve a problem through technology. Two guys. They did this all themselves. It’s a really good idea and one that puts technology to use in the right way. 3. Passion abounds – some might call it over the top, but there is no doubting that professionals in each of these affected industries are incredibly passionate about what they do. You can’t teach passion. You can do what you can to harness it and point it in the right direction, but you can’t teach it. The recognition of such passion around me is inspiring. 4. Technology is no barrier at all – the more smartphones that get adopted by the “regular” consumer, the more comfortable they’ll get with unique interfaces and human-computer interaction. And, to me, this is the key. Because the technology is out there. Gesture, touch, NFC, RFID, QR – I have a feeling that consumers’ comfort with these sorts of technologies are going to be quicker than their comfort with moving from standard phones to smartphones. I was skeptical about NFC and how long it would take to get into market, at least for early adopters, and it’s not going to be long. I’m sure this is something that was discussed at DSE. I’ve had numerous discussions here. I’ve only been here for 1.5 days. I’ve got 9 more to go. This is what has stuck out at me in my short time here. I’m sure that many more will become clear as the days pass. And as they do, you’ll hear them here. For now, good night and good luck. This entry was posted in Digital Signage, Marketing and tagged DSE, emerging techology, NFC, SXSW on 03/09/2012 by Mike Cearley. This is a follow-up post to yesterday’s. This first paragraph is the same, but everything after that is new! Although I’ve spent my last few days at SXSW, I wasn’t really at SXSW. Working the conference means that you operate in a bubble and even the big news rarely penetrates it. From what I hear, though, location and gamification are two of the most prevalent themes. This is important because SXSW is known as the launching pad for emerging trends and start-ups. I suspect Foursquare and SCVNGR – both emerging in their own right – will reap the benefits of being highly present at SXSW this year. Right before the conference, Foursquare announced a partnership program with American Express aimed at recognizing loyalty at local businesses. Some Austin favorites – like Stubbs BBQ and Whole Foods – are participating in the pilot program that gives consumers $5 back when they spend $5 using their AmEx card. Interesting. It’s big news for Foursquare, for sure. This is the type of association they need to make the average consumer aware and familiar with “Foursquare.” And it’s something like this – a partner with a major merchant – that gives them hope of actually affecting consumer behavior enough that it makes a lasting impact on their business. Who knows. That remains to be the million dollar question. Quite literally. I think, for both SCVNGR and Foursquare, these announcements provide more clarity of their place (and use) in the market. SCVNGR is becoming more and more the mobile game that brands and consumers can engage with in out in the real world. 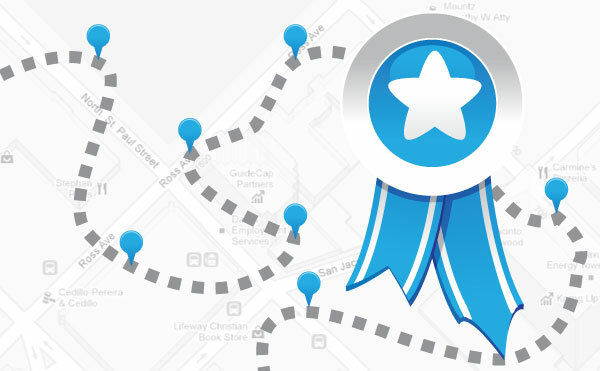 Foursquare is becoming more and more the mobile loyalty tool that brands can use to reward their most loyal customers. But the real question remains – will consumers care enough to engage through one/both/more of these mobile emerging technologies more than once? The rise and proliferation of mobility, beyond mobile phones, will certainly help. I have been using my iPad 2 since I purchased it over the weekend. One thing that stuck out to me was the diverse audience in the lines. That just says to me that there is a growing appetite, by many more people, for more and different mobile devices. More and more people want to experiment and if the experience is good enough, they’ll adopt. So, the technology and the behavior that drives using technology in a specific way will continue to evolve, and for technologies like Foursquare and SCVNGR, this is half of the battle. The other half of the battle is answering the value question. Just because it’s available doesn’t mean people are going to engage. Just because it’s more game-like doesn’t mean people are going to engage. Rewarding loyalty? I can see that driving engagement. But it has to be more wide spread than a single, typically more exclusive merchant than American Express. I couldn’t have participated in the promotion because I don’t carry an AmEx card. I, like many average consumers, am conscious of spending and one of the mantras driving my purchases is, “if you can’t pay cash, you shouldn’t buy it.” I’m willing to bet that I’m not the only one who lets that mantra drive their purchase behavior. I’m also willing to bet that I’m in the overwhelming majority of average consumers who don’t carry an AmEx card. So, what does a promotion like this leave me with? It’s just another example of the value I got out of checking in while I was at SXSW. Nothing. But, you know what? I keep doing it. Because I can. Because it’s a little fun for me. Because I have a tinge of hope of uncovering something new, even if it is a badge. But those are hardly sustainable. For now, though, I keep wandering and wondering. This entry was posted in Emerging Technology, Marketing, Mobile and tagged Conferences, Four Square, LBS, LevelUp, Mobile, SCVNGR, SXSW on 03/15/2011 by Mike Cearley. What will drive mass adoption of location-based mobile technologies? Is it all about the game? 1. The social layer is inherently influential. Word-of-mouth – offline & online – influences those around us, what they like, how they connect, and ultimately what they buy. I don’t see how making it a game changes the influence dynamic. 2. He, like many others I talk to in the world, think in terms of behaviors, not technology. Technology is a means to an end. It is becoming powerful enough to enable certain behaviors, but it’s certainly not the lead. Does the digital signage industry think in terms of behaviors or technology? The one concept that he talked about that I don’t think I agree with much at all – he outlined how many of the principles we associate with games — levels, rules, rewards, motivated players, etc. — are exemplified by our school system. The problem, he says, is that school has an engagement issue: people are bored. I don’t think gamifying the school system is the answer. I think better teachers are the answers. Anyway…. All of this is rhetoric right now. SCVNGR, just like Foursquare, has had a nice little entry into the world. Certain groups of people have latched on. Some brands have, too. But the question remains – what will drive mass adoption? And for the long-term? Is it really adding another layer to life, this game layer? This entry was posted in Emerging Technology, Marketing, Mobile and tagged Conferences, LBS, Mobile, SCVNGR, SXSW on 03/14/2011 by Mike Cearley. So, the road trip came to an end last night. All of the teams made it to Austin safe and sound. They generated tons of great content. It was fun to watch. I think the IOOH experiment was successful. (A few people told me last night that they really enjoyed the interaction.) I greatly underestimated the logistical component of those clues, though. We had to ship and coordinate with ~16 different hotels, all different days to be delivered, and different times to check-in. There were many variables that made this particular component challenging. That’s to be expected, though, when using a guerilla-like approach. We couldn’t do much – this isn’t a sophisticated use of OOH – but the point was to try to be as innovative as we could with this element of the experience. To me, this is an interesting, very realistic way to give people more information/engagement with something as simple and as ubiquitous as post cards. If I were in charge of a city/state branding initiative, where we were responsible for doing the “standards”, like post cards, I would immediately print the cards with some sort of tags/codes like QR codes/MS tags. There would be so many opportunities for deeper, more dynamic engagement and content. You could drive to videos of city/state leaders, citizens, even b-roll-type footage. Even fun facts about the city/state. Even a website (which I know is not preferred, but could be tailored to the content on the card.) Or if you wanted to get a little more creative, you could drive people from a card of say, The Statue of Liberty, to The Empire State building, just the way we did with the scavenger-hunt post cards. It could actually add a refreshing element to these otherwise novel (at best) objects. I suppose in this scenario, these wouldn’t necessarily be true IOOH because the user would, in most cases, end up owning the card, but it’s still a vehicle to enable deeper engagement through an emerging technology. And yes, I think QR codes are an emerging technology in the US. I don’t know if they’ll catch on here, but SXSW is doing their part to introduce them to a large, influential audience. I’ve said it before, but I think one of the top stories coming out of SXSW is going to be QR codes. They’re on the badges, they’re posted around the convention center, and we’re contributing by using them in various ways. We’ve placed them on all of the ride & drive Chevy vehicles so that people can learn more about each vehicle that they’re riding in or seeing out in the open spaces around the convention center. And we’re placing them on a new car – the Cruze – as a way for people to interact with it because here, they can’t drive it or even get inside it. 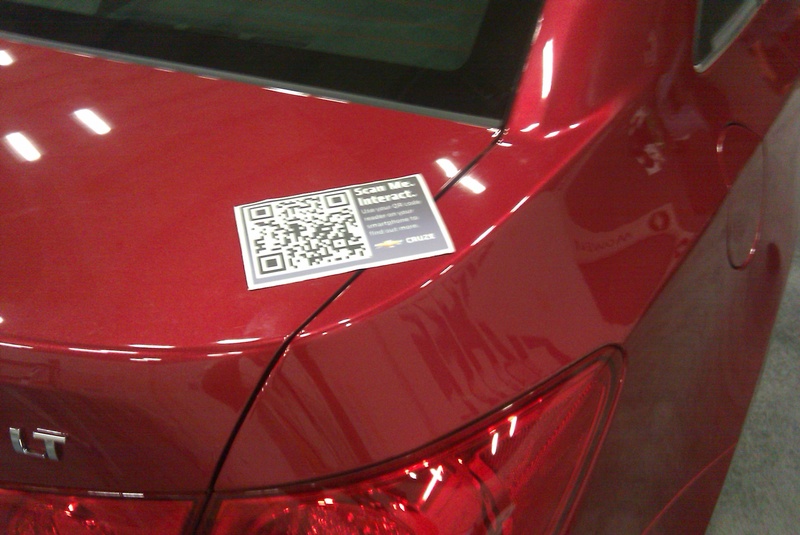 All of the codes are placed on the car in locations that are specific to the content that they’ll receive. 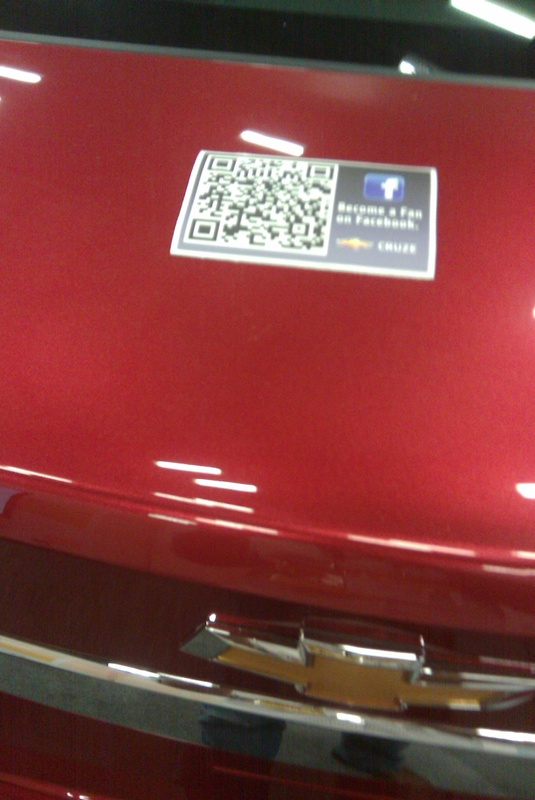 So, if someone wants to learn about the Cruze’s engine, they’ll take a picture of the code on the hood of the car. The content behind the codes, though, is really going to be key to make these things compelling and show their potential in how they can benefit the user. We’re incorporating Chevy-in-pop-culture facts centered around film & music with the ride & drive vehicles, as well as special product content. With the Cruze, we’re incorporating quizzes and exclusive video content that people can only experience in this way – through these QR codes at SXSW. The payoff has to equal, or preferably, outweigh the buildup. Otherwise, it just makes for a bad experience and bad experiences are, well….bad. I’m confident in ours. Tomorrow, we’ll find out. More to come tomorrow, after the booth opens and the Cruze is covered in codes. Farewell for the night from Austin! This entry was posted in Emerging Technology, Marketing and tagged Chevy Cruze, enabling technology, Interactive Out of Home, IOOH, MS Tags, QR Codes, SXSW, SXSW 2010 on 03/12/2010 by Mike Cearley. 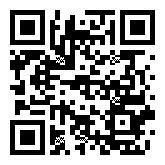 Does everyone automatically have QR code mania? It seems like they do in my world. The last two weeks have been filled with questions and examples and tweets about QR codes. I’m even planning an initiative with QR codes (more to come on that in the near future!) Everywhere I turn, I’m hearing and thinking about QR codes. I’ve seen some good examples, like the recent Detroit Red Wings program, that enables users to watch an exclusive video from their mobile phones. The call-to-action is clear, informative, and the Red Wings even play an instructional video during their games. They’re seeing success and even thinking of ways they can extend fans’ experience beyond this initiative. I’ve seen bad examples, like the Weather Channel on-TV code, that enables users to automatically download the Weather Channel app. This execution falls short on a number of levels, most notably originating from a TV screen. I think the beauty in these codes is that they’re able to extend a non-digital medium into a digital medium in a seemless fashion. Aside from that, the call-to-action isn’t clear and the app is only available on Android devices. And you would think that a television network would have ample opportunity and resources to share instructional videos on new technology that they want their audience to engage with, even more than a sports arena. And I’ve seen future examples that I’m about to experience myself. SXSW is including QR codes on name badges to instantly connect attendees with other attendees. I will be interested to see an audience like this, completely up on technology, interact with it and each other. I’m also interested to see how SXSW introduces them to attendees on-site and the resources that they make available for all of us. On the surface, I’m happy that I’m in the midst of QR code mania, but like all emerging technologies, QR codes can easily be more ineffective than effective. Especially in North America, where this technology still has not caught on, despite its acceptance and success overseas, particularly in Japan & Southeast Asia. A huge barrier is our mobile phones and the various platforms and inconsistent reader applications. One app can interpret the data as a V-card, while one can interpret the data as a text message, one only operates on the iPhone and one can work across most mobile platforms. And, oh by the way, each one of these reader apps must be installed by the user before they can be used. I think these particular barriers are all relatively minor for the potential return. Installing the right reader application on my phone is not a laborious process. It’s certainly worth it when I can simply take a picture of a code and experience some sort of deeper, personal engagement. And QR codes, themselves, are so easy to make that anyone can really incorporate them into any initiative in a matter of minutes. What we have to consider though – the thing that makes the difference between ineffective and effective – is the complete experience. The devil’s in the details, so they say, and they can either make the Red Wings experience or the Weather Channel experience. To be effective, the user needs to know exactly what to do. They need to know what to download on what type of phone and once it’s downloaded, what exactly to do then. It seems simple, but the call-to-action must be clear and concise. These types of experiences are not website-like experiences where users know what to expect on a click, and even then, users need to be encouraged to click that particular box or image or text. This is a new experience. Most people don’t even know what QR codes are. But they can accept them and will even interact with them if they’re given clear instructions and expectations. The payoff has to be there on the other end, too. That’s another element of the experience that can make or break these initiatives. What content is the user going to see or interact with once they take a picture of that QR code? Is it a video? Is it a pre-drafted tweet? Is it an app? Or better yet, is it something that is only offered in this particular way through this particular channel? QR codes can enable immediate interaction with meaningful content in a unique way. They can enable extremely rich experiences and in doing so, can help build trust between brands and their audience. But to be effective, they must be used the right way. They must be thought through. And in the end, they must not be done just to be done, just because they’re the mania of the day. What QR code executions have you seen that are most effective? What are the least effective solutions you’ve seen? Let me know! This entry was posted in Emerging Technology, Mobile and tagged Mobile, QR Codes, SXSW on 02/11/2010 by Mike Cearley.